Despite heightened interest in the study of the Muslim faith, for many people Islam remains shrouded in mystery and confusion. What really is Shariah law? How is a Muslim to understand Jihad? Does Islam oppose Western values such as free speech or freedom of religion? What place do women have according to Islam? Understanding that this confusion has as much to do with the behavior and words of Muslims as it does with allegations made by anti-Islam activists, Demystifying Islam offers refreshingly bold answers to provocative questions about Islam today. Harris Zafar, lecturer, writer, teacher, and national spokesperson for Ahmadiyya Muslim Community USA, is forthright about issues on which Muslims disagree, and he digs into history to track the origins of differeing beliefs. From the burqa to the role of Jesus in Islam, Demystifying Islam is an essential resource and a concise guide to understanding the fastest growing religion in the world. 300 Physical Desc $a Extent 204 p.
520 Summary $a Summary, etc. 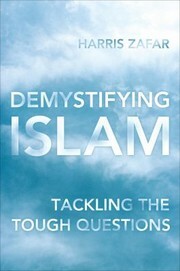 note Despite heightened interest in the study of the Muslim faith, for many people Islam remains shrouded in mystery and confusion. What really is Shariah law? How is a Muslim to understand Jihad? Does Islam oppose Western values such as free speech or freedom of religion? What place do women have according to Islam? Understanding that this confusion has as much to do with the behavior and words of Muslims as it does with allegations made by anti-Islam activists, Demystifying Islam offers refreshingly bold answers to provocative questions about Islam today. Harris Zafar, lecturer, writer, teacher, and national spokesperson for Ahmadiyya Muslim Community USA, is forthright about issues on which Muslims disagree, and he digs into history to track the origins of differeing beliefs. From the burqa to the role of Jesus in Islam, Demystifying Islam is an essential resource and a concise guide to understanding the fastest growing religion in the world.